Is there anything more universally dreaded as the performance review? What is intended for good – to help you manage the performance of your employees – has morphed into a time consuming process to complete pages upon pages of evaluation forms by an unreasonable deadline. But it doesn’t have to be this bad! We have a solution for you. 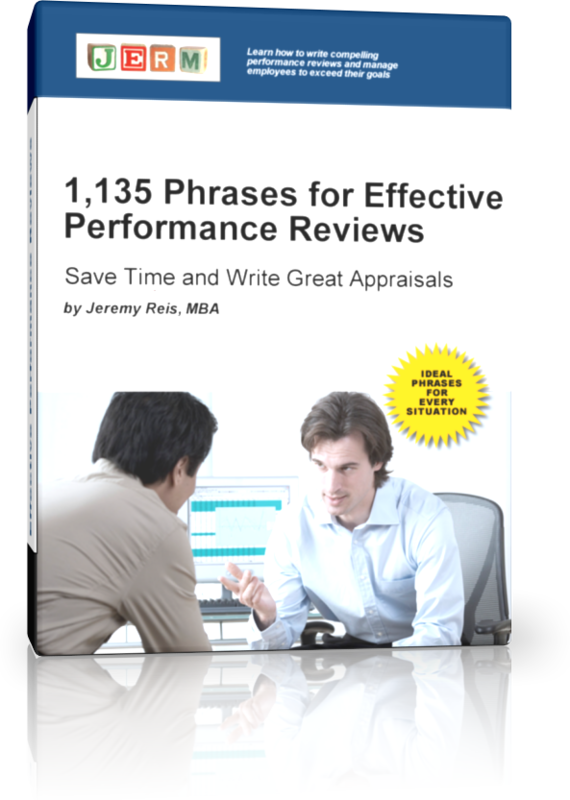 We’ve professionally written 1,135 comments across 23 self evaluation categories, each grouped into positive phrases (think meets expectations and exceeds expectations) and negative phrases (needs improvement and below expectations). These sample phrases are generic enough to apply to your employees. This book will help you find the right words to describe anyone. The sentences are crafted in such a way as to apply to your employees so you can copy, paste, change the name and add in a few more details and be on your way to finishing the performance evaluation quickly and effectively. This book will not only help you complete the performance evaluations in a timely and professional manner, but it will provide more time for you to think about your employees’ goals, performance, and how to improve over the next year. This is what the performance evaluation process needs! An opportunity to focus on performance management – what manager doesn’t want that? If you’re looking for a book for employees to complete their own self evaluation, check out our self evaluation book.